New dad Jimmy Fallon has given his own spin to "Sesame Street's" theme song. The host of "Late Night" dusted off his collection of kids' musical instruments for a little rendezvous with the colorful beings that live on the "Street," including Big Bird, Cookie Monster, the Count, Grover and Elmo. 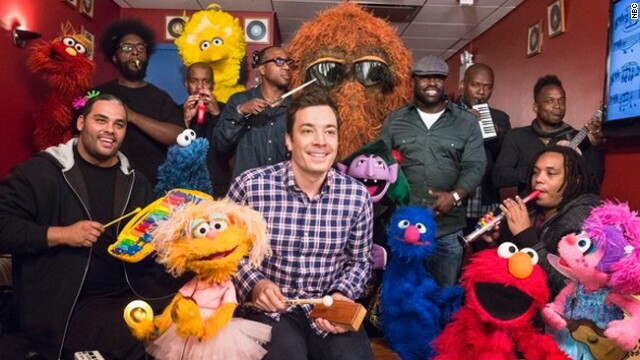 Armed with bongos, a xylophone, a kazoo and more, "Late Night" house band The Roots helped Fallon and the muppets give the theme song a fresh remix. It starts off the way you remember it - "sunny days sweepin' the clouds away," etc. - but by the time rapper Black Thought drops his verse in the middle, it's even more fun. Check out "Late Night's" version below, and tell us - how does this installment stack up with Fallon's kid-instrument takes on "Blurred Lines," "Call Me Maybe" and "All I Want for Christmas Is You"? told 05 about the show. Where are Ernie and Bert? Having wild g@y $ ex with Elmo. It was pretty neat until the rap part. Great, now the children's TV characters are singing that misogynistic sh!t song "Blurred Lines". What has the world come to? Your'e an idiot, there was not blurred lines on here. You should check yourself next time you decide to post a comment! Better yet, turn off your computer and go outside. The Internet is no place for dweebs like you. Hang it up.